Robots are everywhere – in the media, at least, they are a ubiquitous phenomenon. But in our daily lives, too, intelligent machines are much more common than most people think. Already, our cars, washing machines, ATMs, and many other devices are at least partially robotic. And in the future – this much is certain ) our environment will become ever more intelligent, autonomous and self-learning. This is the intro of an exposition I visited last week at the Design Museum in Ghent. The expo is titled just like the title of this blogpost: Hello, Robot. 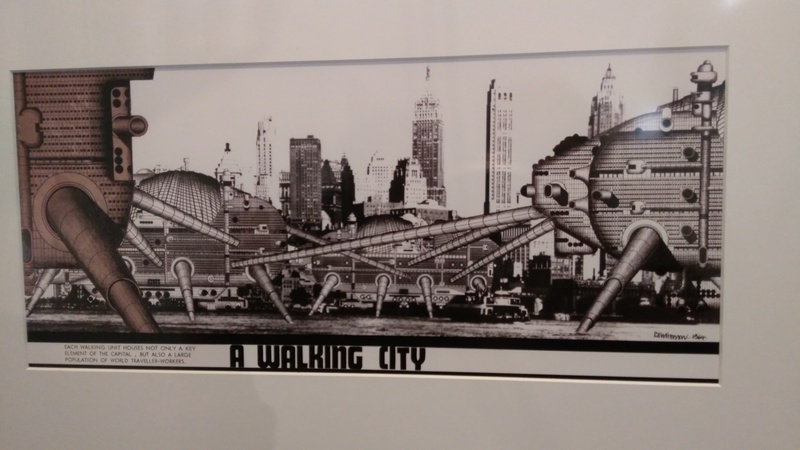 Last year I also visited an interesting expo called ‘A glimpse in the future of cities’. Less interesting but also worth a visit back then. Bottom-line of the expo ‘Hello, robot’ is that we all acknowledge the existance of robots but aren’t really aware of their omnipresence. You’re actually reading this via a robot so no use to disagree. Are robots our friends or our enemies? How do you feel about objects having feelings? 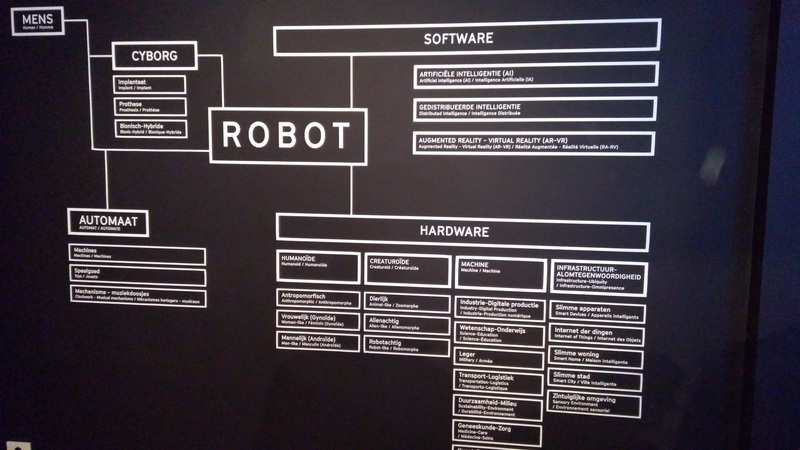 By walking through the exposition you start to understand better the different interactions between humans and robots. Or just take a look at all the different movies that are made about robots and you’ll start to see how people are fascinated about them (e.g. I, Robot; Blade Runner;….). But the main reason I wanted to write something about this, is of course the link between robots and cities. And also because it just was eye-opening. You can find robots everywhere in the city. In fact, robots are crucial for a city to operate smoothly. Smart mobility being one of the best examples I believe. Just take a look at the evolution of self-driving cars. Or what about a city application that suggests places you should visit. Or an online portal where you can find official documents. Or even the ticket you take from an ATM before queuing at the city counters in the city hall. It’s important to define which roles each robot has in our society today. Therefore you can use the ‘Pyramid of Technology’. Allocate which need the robot forfills and than you can position the robot in the pyramid. More about the pyramid in this TedTalk I found online. Something I asked myself is where do we put ‘Smartphones’? It’s for sure already part of our daily life and fully accepted, so level 4. But can we live without it? Is it already fully level 5? It depends on how you define ‘live without it’. That’s enough about the talks, time to talk about the walks: robots! Something I learnt: robots are having the biggest problems with the easiest things a human can do, but they are much better in the most difficult things we do as a human. As a human it’s easy to write a letter but it’s difficult for us to press more than thousands books in very short notice. 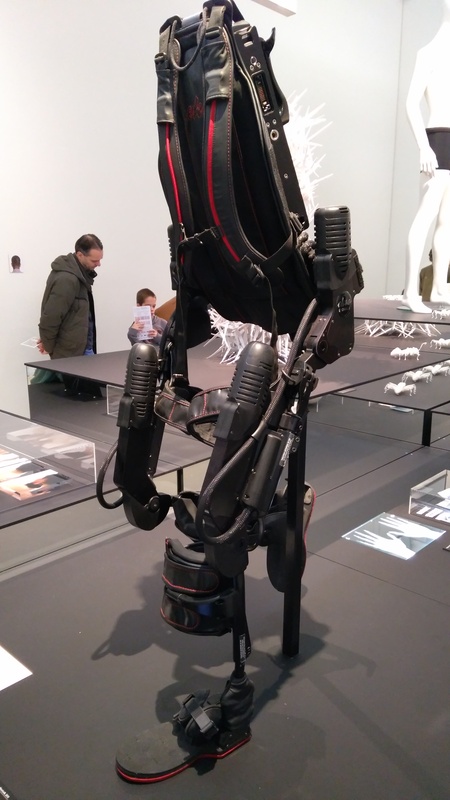 We call this a exoskeleton and they help paraplegics to stand up and learn to walk again. 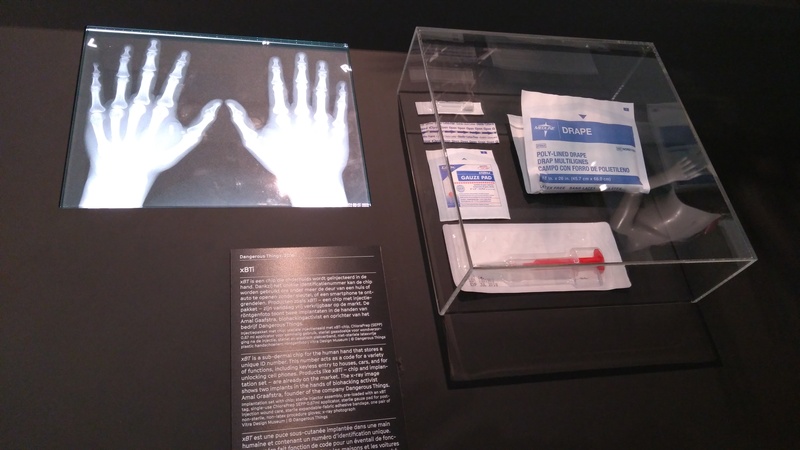 xBT is a sub-dermal chip for the human hand that stores a unique ID number. You can use it to open a door, a car, unlock your smartphone,… A bit freaky if you ask me… And it’s already avaible on the market apparently. But also this well-known robot was showcased and is already very popular in the US: Alexa. Alexa is the name of the digital assistent made by Amazon. Echo is the device you buy, Alexa its nickname. When you link your Spotify account to Alexa she will learn through AI what’s your favourite song. Consider Alexa as the first step to the internet. You can ask it/her anything. Google also has one with Google Home. The reason why these devices are being developped are easy to summarize: to get your money. Via Alexa, Google Home,… they want to get to know you and deliver you products that they know you want because they know you better than you know yourself. If you say you have nothing to hide and you are willing to give up your privacy, just read this blogpost. And remember that Alexa and her friends record everything and never forget. A freaky friend that Alexa if you ask me. Besides Alexa, also Leka was at the expo. Leka is a ‘smart’ toy to stimulate the communication between autistic children and their parents, doctors,… I already like Leka more than Alexa. All these robots are part of the Internet of Things. According to the experts IoT will comprise more than 50 billion objects by the year 2020. It was Le Corbusier who said: ‘A house is a machine for living in’. And it was Ron Herron who designed this idea in 1964 with ‘The Walking City’. It portraits intelligent, mobile, containerlike structures that ‘walk’, temporarily clustering together into cities and then dispersing. The idea of MX3D Bridge is that 6 robots will 3D-print a bridge in Amsterdam. The project relies on one robotized technique instead of the usual many techniques to build a bridge. The bridge even has a Facebookpage where you can find updates of the building process. This question was relevant during every industrial revolution the past decades (looms and steam engines, personal computer, internet,… and now robots). Something I didn’t noticed during the expo but also fascinates me is the question if robots can feel pain. I remember I saw a video of somebody pushing a robot (bullying a robot so you will) and people reacting very concerned about it. Or how do you feel about this video? The future will tell the impact of robots, but after this expo I’m pretty sure that robots will claim their spot in our lives. To pick up where the expo started: I’m personally more frightened about the software (AI, AR-VR,…) than the actually hardware because if you can’t see the robots, is hard to control them. What if robots really become nature (level 7)? And what with the people of our society who can’t cope with all these robots? A happy new year and let’s hope it’s a good one, without any fears (and robot take-overs).